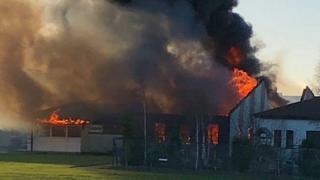 More than 200 pupils have been evacuated from a primary school in Fife after a large fire broke out. 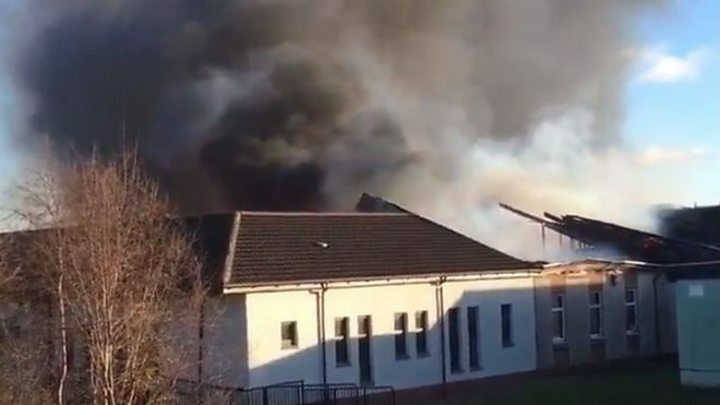 At least 30 firefighters were involved in tackling the blaze at Cairneyhill Primary School near Dunfermline. Pupils and staff were all "safe and well" and were moved to a nearby church hall, Fife Council said. Local residents were asked to keep their windows closed and stay away from Northbank Road while emergency service workers dealt with the blaze. The fire, which broke out just after 13:00, was later contained by the fire crews, some parts of the school were badly damaged. Firefighters remained at the scene on Friday evening to check for any hidden fire spread. Group manager Richie Hall, the incident commander, said: "It was a challenging environment but they did a tremendous job through difficult conditions to find that source, contain the fire - and then fight it. "Their efforts meant that the fire, located in the centre of the building, was prevented from spreading any further. "They are now searching for any further pockets of fire to ensure the building is made absolutely safe." Mr Hall commended firefighters for their efforts in bringing the incident to a "swift and safe" conclusion. He added: "I must also pay credit to both the children and the school staff who evacuated quickly and calmly, and made their way to a place of safety." The children were looked after at Cairneyhill parish church hall until they could be collected by parents. There are around 223 pupils on the roll at the primary school, with approximately 48 in its nursery, according to its website.